My sister-in-law has four daughters. Her youngest was just born in July. Being baby number three born in four years, it can be hard to get personalized, special, and unique gifts that aren't hand-me-downs from your older sisters. I wanted to give each of my nieces something unique this holiday season. Ornaments.com offers popular ornaments from around the world, offering you a variety of different options and styles of ornaments. The designs range anywhere from the cute and cuddly to the exquisitely beautiful. Use the Ornament Finder search tool to look for ornaments for baby's first Christmas, gifts for your child's teacher, ornaments for a favorite little league player, or a personalized ornament to remember the year for everyone in the family. I wanted so many of their handmade ornaments, but I wanted to give my niece a "First Christmas" ornament. Ornaments.com has so cool and unique ornaments to choose from. It was so fun picking out the one I thought would be perfect for her. Ornaments.com has outstanding customer service and made sure I received exactly what I wanted. I love that each ornament comes in a little gift box already so you can gift them with ease. One lucky Nanny to Mommy reader will win a personalized ornament of choice. Entry is simple, just follow the prompts on the Rafflecopter below. Open to US only, must be 18+ to enter. Winner chosen via Random.org through Rafflecopter. All winning entries are verified. Please follow us on Facebook to stay up to date with our current giveaways. Good luck! Welcome to "Super Stocking Stuffer Giveaway Hop"! This event runs November 16th to 30th, 2016! This was featured in our 2016 Holiday Gift Guide, if you would like to see your item featured, please contact us. I received complimentary products from Ornaments.com to provide this post. All opinions are my own. Facebook, Twitter, Pinterest and any other social media are not affiliated with this giveaway. Nanny to Mommy received complimentary products to provide this review and giveaway. 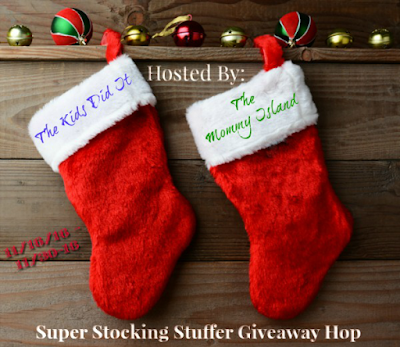 Nanny to Mommy and participating "Super Stocking Stuffer" Giveaway Hop bloggers are not responsible for sponsors who do not fulfill prize obligations. This giveaway is open to US only, must be 18+ to enter. Cannot be shipped to P.O. boxes. One entry per household/IP address. No social media was involved in this giveaway in any way. Winner is chosen via Random.org through Rafflecopter. ALL winning entries ARE verified. Winner will have 48 hours to respond with all information in email or another winner will be chosen. If you would like to see your product featured on our blog or sponsor a giveaway event, please contact us. I would choose the Around the Piano Ornament, Family of 4 People. I want baby's First Christmas for our grandson that will be here in 2 weeks! I would get the Family Decorating Tree, 3 people for hubby, me and my son. How super cute! I would choose the Panda Ornament, Family of 4. I would choose the Tennis, Caucasian Male ornament for my grandson! I like the baby in a pink stocking for my granddaughters first Christmas. I really like to get the Baby in Stocking Ornament in pink for my granddaughter. I would choose the Pug ornament for my sweet puppy. I would get the brunette runner ornament because I love to run. I would get the Baby's First Christmas ornament for my new grandson. I like the Custom Photo Ornaments. It could be for anybody & personalized for anyone. I really like the pet ornaments! The Shih Tzu Ornament - Black & White, and I wish there was one for a great dane! I would pick the Baby in the Snowflake, that is so cute!!! Oh I would choose the School House Personalized Ornament! That would be so cute for Teacher! If I won, I would pick the Custom Photo Ornament - Twine. I like the You Are My Sunshine ornament. I'd probably choose the I Will Sing Glass Ornament. Thanks. I would choose the cardinal ornament. Very pretty! I really like the Baby in Stocking Ornament in pink for my youngest granddaughter. I would get the Pajamas Family of 4 Ornament for my Daughter's family, since the baby they now have 4 in the family. I would love to get the Cat Relaxing in Wreath Ornament. It is adorable. I like the family ornaments especially the penquin family of 4 ornaent. i would choose the 2016 Penguin at the North Pole for my son. 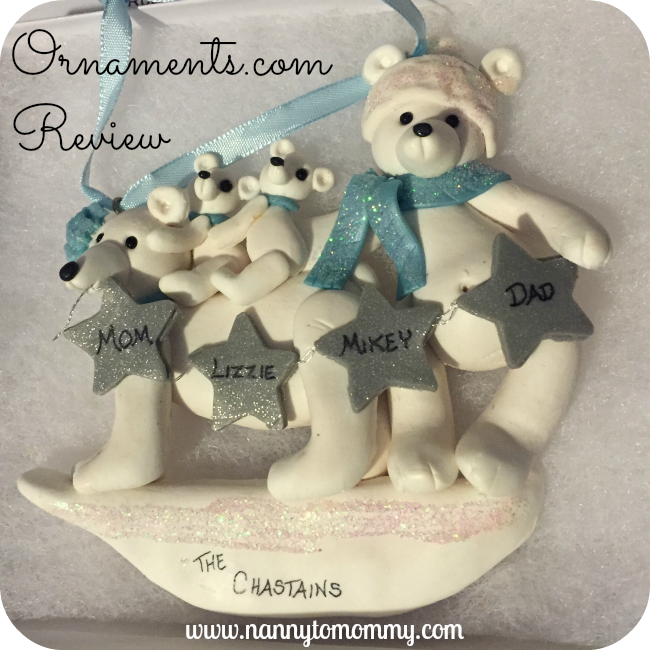 I would choose the Black Bear Family of 4 Personalized Ornament! I would love the Golden Retriever ornament. We had to put ours down in September and our hearts are still broken. Her back legs went out on her. We miss her so much! I would get the Army Fatigues Ornament in honor of my son who passed away in 2011 due to injuries he sustained in Iraq. I love the Baby Snowflake Personalized Christmas Ornament, Pink. This year is my niece's first Christmas! kristiedonelson(at)gmail(dot)com Thank you. I would choose the Owl Christmas Ornament Family of 5. I love the penguin family ornament. i love all these ornaments so cute. I would choose the Army Fatigues Ornament, Male, Caucasian as my husband is in the Army.